Scroggins, Dorothy Jean Jeffers (Allen) (12 Jan 1932 - 25 Dec 2011) . Wife of Scroggins, James David (10 Feb 1930 - ca. 25 Sep 1963) . Scroggins, Morris Lee (28 Nov 1924 - 25 Dec 2011) [50659:M]. 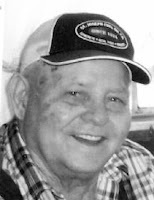 Husband of Scroggins, Dora Maxine Ray (13 Aug 1927 - 2 Nov 2012) [51085:M]. Cooper, Walter G. (ca. 1916 - 15 Dec 2011) [42977:L].